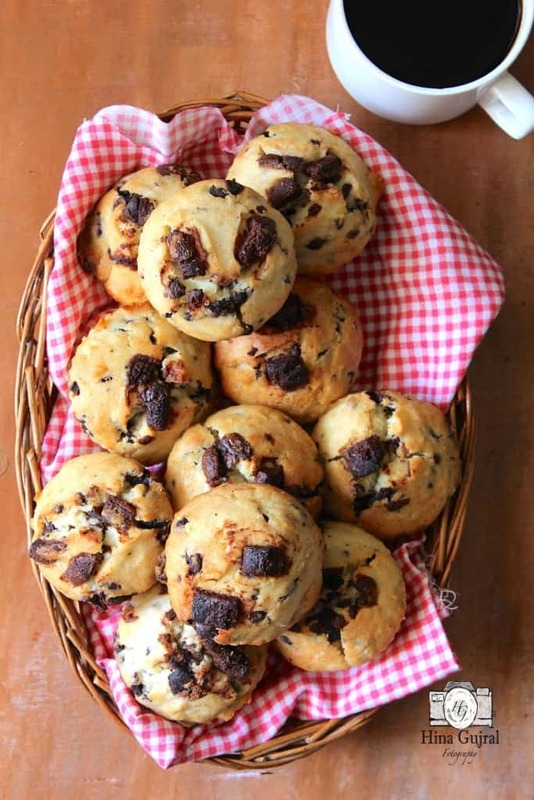 Double Chocolate Chip Muffins are soft, spongy, easy to make muffins loaded with the double dose of chocolate chips.The double addition of chocolate makes these muffins favorite of every chocolate lover. 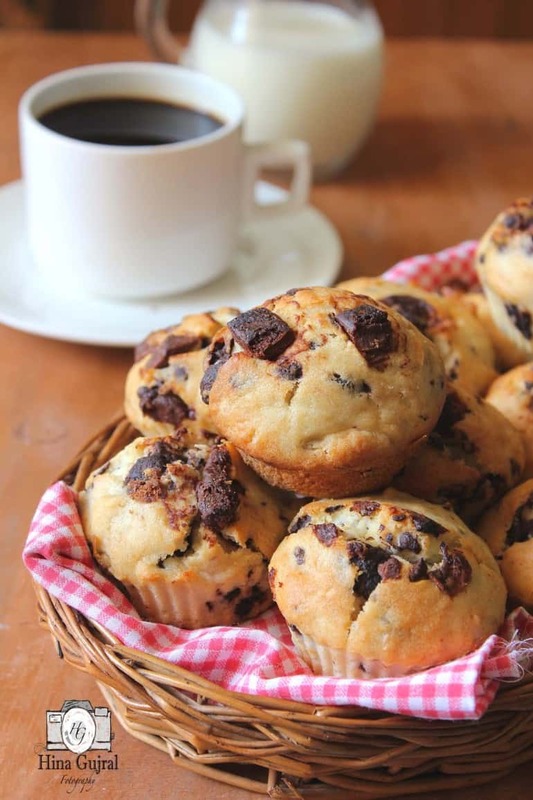 This is a very straightforward and easy Double Chocolate Chip Muffin recipe. And the end result is soft muffins paired with the melty chocolate and the crunchy tops. The aroma of these chocolate muffins engulfs the kitchen air, filling the morning energy with the sweetness. I grabbed little pieces of the muffins here and there while finishing off the daily chores along with the cup of black coffee. They are a perfect “anytime” chocolatey snack. If you like moist and airy muffins than trick is to beat your sugar and butter till it turns out creamy, light and doubles in size. It is always best to use an electric hand mixer for the purpose. Because if you doing it manually chances are there that the batter might not be whisked up uniformly. Trick number two is not to beat the eggs for a very long time. And at last, do not over mix the batter. Over whisking will incorporate more air than required in the muffin batter which will result in cracked and flat muffins. Enough of “muffin science” I have explained now it’s time for the recipe. But these little baking hacks have always helped me to bake a foolproof muffin/cake. And often as a novice baker we overlook these fine details of baking. 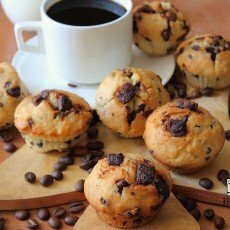 Double Chocolate Chip Muffins are soft, spongy muffins loaded with chocolate chips making them simply indulgent. Preheat you oven to 375° F (190° C). Line muffin tray with paper liners and grease them with little butter or oil. Sift together flour, baking powder and salt together in a bowl. Stir in the chocolate chips. Combine well and keep aside until required. Now cream butter and sugar together in a large bowl using hand mixer at medium speed until light, crazy and fluffy. Add one egg at a time and whisk for a minute or so each time. Now add the milk, chocolate essence and vanilla extract to the liquid mixture. Once again whisk with the hand mixer until well combined approx. for 3 – 4 minutes at medium speed. In small batches add the sifted flour mixture to the liquid ingredients. Gently fold the batter using the rubber spatula. Make sure there are no lumps or streaks remain in the batter. Scoop equal amount of batter into the prepared muffin tray. 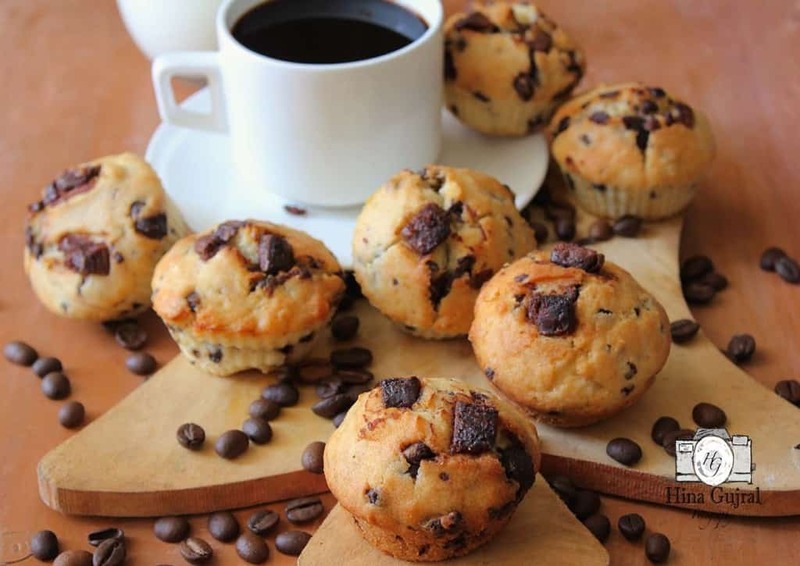 Top each muffin with milk chocolate pieces. Bake the muffins for 20 minutes or until a toothpick inserted in the centre comes out clean. Once baked transfer the muffins to a wire rack to cool down for few minutes. 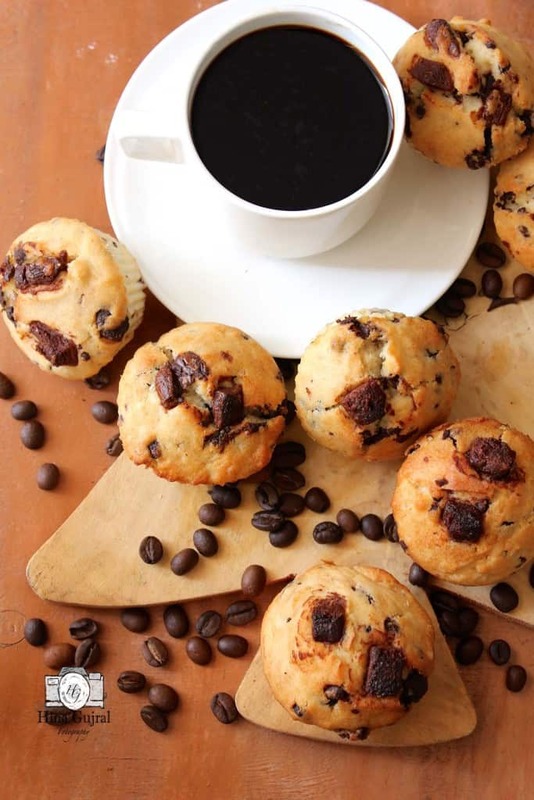 Serve Double Chocolate Chip Muffins with a cup of coffee for that extra chocolaty flavour. I can never go past a good choc chip muffin.. especially when they look as perfect as these. I wish I had one now!